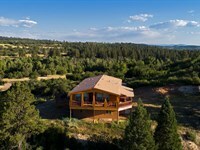 This beautiful 4-bedroom, 2-bath mountain home is snuggled amid pine, cedar, and oak trees on Buckman Road as it ascends the heights to give spectacular views of the valley, Chama Peak, and surrounding mountains. The home's 6.5 acres provide ample room for horses and various pets, while being home to an assortment of native wildlife that roam the area, including deer, elk, bear, bobcats, turkey, and a large variety of wild birds. Wrap-around decks provide amazing views in each of the four seasons. Fourth of July fireworks in Chama can be clearly seen from a sturdy yard swing, that also affords solitude. Two graveled driveways accommodate summer/winter conditions and lead to ample parking. Motion lights surround the house. The workshop/garage is a great place to store mountain toys and equipment. The kitchen and much of the house has been recently remodeled, including new flooring, carpet, and paint. The kitchen sports lavish new counters, hickory-wood custom cabinets with pullout cupboards, and new appliances stove/microwave combo, dishwasher, and side-by-side refrigerator/freezer. Other features include fireplace, wood stove, many windows, skylight, and jacuzzi. Close to Hwy 84/64, yet secluded and private. Property is being offered turnkey, having 2 living areas, utility room, breakfast nook with bay windows, washer, dryer, beds, bedding, furniture some custom made, appliances, dishes, cookware, and more.